For those of you who are interested, I have now made a pdf copy of my thesis available online. Entitled On the Road to Replacing Oil: A Well-to-Wheels Study Exploring Alternative Transportation Fuels and Vehicle Systems, the study does just that: explores the well-to-wheels energy use and emissions associated with several dozen full well-to-wheels fuel/vehicle combinations. The study was submitted in June as my undergraduate honors thesis in fulfillment of the requirements of the Robert D. Clark Honors College at the University of Oregon, for which I recieved a 'Pass with Distinction' (the highest marks awarded to undergraduate theses). Growing concerns about the depletion of world oil supplies and the resulting consequences, as well as concerns about global climate change motivate us to find solutions to replace oil consumption while reducing greenhouse gas emissions. This study explores the performance of various alternative transportation fuels and vehicle systems to reduce consumption of oil and other fossil fuels as well as emissions of greenhouse gases and several harmful pollutants. This study focuses on the light-duty vehicle fleet (all vehicles less than 8,500 pounds) as this segment of the transport fleet accounts for the bulk of transportation oil consumption. To provide a means to objectively compare the energy and emission effects of various fuels and vehicle technologies, this study conducts what is known as a ‘well-to-wheels’ analysis of each of the full fuel/vehicle pathways considered in this study. That is, this study quantifies the energy use and emissions along the entire fuel pathway that are associated with each mile traveled by a vehicle fueled with a specific fuel. To perform the well-to-wheels calculations, I utilized the Greenhouse gases, Regulated Emissions and Energy Use in Transportation (GREET) Model developed by Argonne National Laboratory's Center for Transportation Research. I focused on the year 2025 in order to allow sufficient time for the light duty fleet to change and to allow certain technologies time to develop/reach market (i.e., hydrogen fuel cell vehicles, plug-ins, etc). I performed extensive research to determine appropriate inputs for GREET to represent conditions in 2025 and also modified the GREET model to include several new pathways (and to make other modifications to improve the accuracy and completeness of the model). Total and urban emissions of five criteria pollutants: CO, NOx, SOx, Particulates (PM10) and Volatile Organic Compounds (VOCs). These results were generated in Btu or grams/vehicle mile travelled. I modeled a total of 70 full well-to-pump fuel pathways (variations of the above general pathways) and 15 different vehicle systems. When combined, these could create over 100 full well-to-wheels fuel/vehicle pathways, but I generate results for only 60 full well-to-wheels pathways (available in an appendix). The primary motivations for this study were to examine the potential for various alternative transportation fuels and vehicle propulsion systems to reduce petroleum consumption, GHG emissions and criteria pollutants (particularly those occurring in urban areas) resulting from the light-duty transport sector. To do so, this study conducted an analysis of several dozen full well-to-wheels (WtW) fuel/vehicle pathways and presented results using 17 different metrics including total, fossil and petroleum energy use and emissions of three GHGs (as well as total global warming potential-weighted GHGs) and total and urban emissions of five criteria pollutants. As this study’s results indicate, conducting an analysis of the full WtW pathway for the various fuel/vehicle systems considered is crucial, as upstream, or well-to-pump (WtP), stages contribute significantly to the total energy use and emissions associated with traveling one mile in a given vehicle fueled with a particular fuel. This is true even for criteria pollutant emissions as increasingly stringent vehicle tailpipe emissions regulations (i.e. new Tier 2 and low-sulfur fuel standards) continue to reduce emissions during the vehicle operation, or pump-to-wheels (PtW) stage. Additionally, it is crucial to differentiate between different types of energy inputs as much as possible as energy derived from different sources can have vastly different consequences on resource depletion concerns, energy security and foreign policy. This study thus aimed to provide a more meaningful analysis of the impacts of energy use by dividing energy inputs into total, fossil and petroleum-derived energy. Some studies only present results for total energy inputs. This can be very misleading, as pathways relying largely on renewable energy may appear very costly when total energy is the only metric examined, despite the fact that these pathways may offer considerable fossil and/or petroleum energy use reductions. 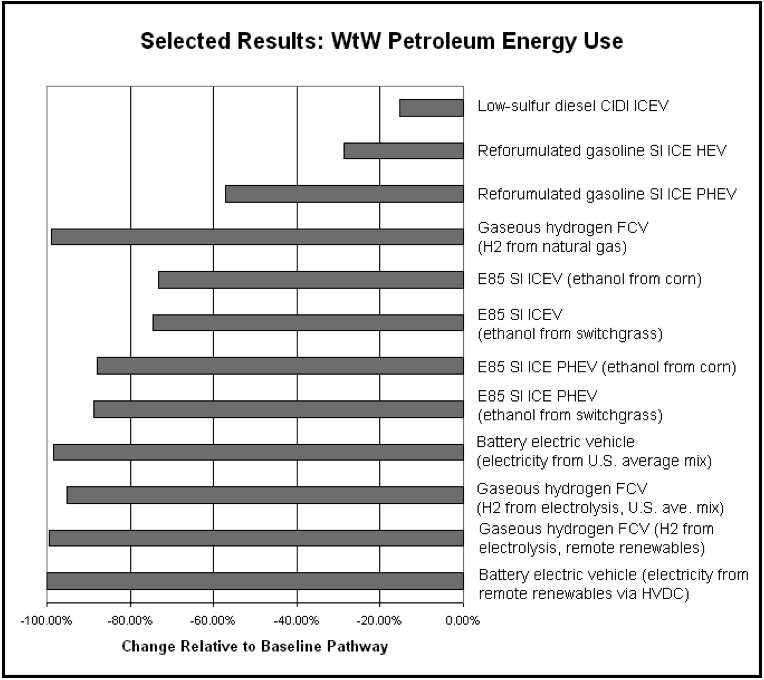 This study finds that the fuel production and vehicle operation stages are generally the two most important stages in determining WtW results for the various metrics. The fuel production stage generally has the largest energy losses and results in the most significant emissions of any upstream WtP stage. This is particularly true for petroleum-derived fuels (i.e. gasoline and diesel), ethanol from corn, and especially electricity and hydrogen. Additionally, PtW vehicle fuel economy is particularly important as it directly affects the amount of fuel consumed and thus the level of upstream WtP energy use and emissions associated with traveling one mile in a particular vehicle. 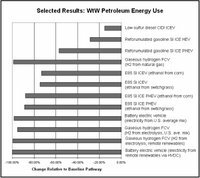 The WtW results generated by this study indicate that there are a variety of alternative fuel/vehicle system pathways that could reduce petroleum consumption related to the light-duty transport sector. All of the alternative pathways considered reduce petroleum energy use somewhat relative to the baseline pathway (i.e., a spark-ignition internal combustion engine vehicle fueled with reformulated gasoline [RFG]), while some nearly eliminate petroleum energy inputs. Alternative (non-PHEV) petroleum-fueled pathways result in petroleum energy use 15-33% less than the baseline pathway, almost entirely due to increased vehicle fuel economy. The pathways that achieve the most significant petroleum energy reductions are those that switch from petroleum to another basic energy feedstock – i.e., natural gas, biomass, or electricity (which is primarily from non-petroleum-fired power plants). Pathways that nearly eliminate petroleum energy inputs include compressed natural gas (CNG) and hydrogen derived from natural gas, as well as all electricity and electrolytic hydrogen pathways. Use of ethanol in E85-fueled vehicles also offers significant petroleum energy reductions of nearly 75% with the remaining petroleum energy use largely due to the fact that E85 contains 15% RFG by volume (and 21% by energy content). Despite the fact that many pathways result in significant petroleum energy use reductions, several of these pathways (i.e., natural gas and electricity-based pathways) achieve these reductions by substituting other non-renewable fossil fuel-derived energy inputs. In some cases, particularly those reliant on natural gas, this may mean that these pathways offer fewer benefits than indicated by the petroleum use reductions they achieve, as natural gas is also subject to resource depletion and related concerns. Natural gas supplies in North America are already tight and any increased reliance on natural gas for transportation fuels could simply displace concerns about imported oil to concerns about imported natural gas, much of which is located in unstable areas of the world. This points to the importance of examining fossil energy use in addition to petroleum energy use. The pathways that result in the most significant fossil energy use reductions are clearly those pathways that rely on renewable energy inputs – i.e., the biomass-based ethanol pathways and the electricity-based pathways utilizing energy from remote stranded renewable resources. Several other pathways also result in significant reductions in fossil energy use between 25-65%, however, due to the overall WtW efficiency of these pathways. These include the hydrogen-from-natural gas pathways as well as the battery electric vehicle pathways and most PHEVs fueled with electricity from the U.S. generating mix. Additionally, the ethanol-from-corn pathway results in fossil energy use nearly 35% lower than the baseline due to the use of corn as a feedstock. Thus, there are several pathways that offer significant decreases in both petroleum and fossil energy consumption. Nearly all of the pathways considered by this study offer some reduction in GHG emissions. GHG reductions are somewhat correlated with fossil energy reductions, although this correlation can be thrown off by the different carbon contents in the various fossil fuels. Natural gas-based pathways, for example, offer larger GHG reductions than fossil energy reductions since natural gas is 21% less carbon intensive (i.e., has 21% less carbon per Btu) than crude oil and 22% less carbon intensive than RFG. In contrast, the GHG reductions for the diesel pathways are slightly smaller than the corresponding fossil energy reductions due to the fact that low-sulfur diesel (LSD) is 6.5% more carbon intensive than RFG. Still, as with fossil energy reductions, the pathways that offer the most significant reductions in GHG emissions are those that rely on renewable energy inputs, including the biomass-based ethanol pathways and electricity pathways utilizing remote renewables. The remote renewables-based pathways, for example, nearly eliminate GHG emissions, while the biomass-based E85 pathways offer GHG reductions between 72-83%. The remaining GHG emissions for these E85 pathways are the result of combustion of RFG contained in E85 blends. Several other pathways that rely on feedstocks containing carbon also achieve GHG reductions, however, primarily as a result of high overall WtP efficiencies and/or low vehicle fuel consumption. The hydrogen-from-natural gas pathways and the various PHEV and BEV pathways fueled with electricity from the U.S. generating mix offer reductions on the scale of 40-50% due largely to high PtW efficiencies and zero vehicle operation emissions (or in the case of PHEVs, zero emissions during all-electric driving mode). Additionally, several other pathways, including corn-based E85, CNG, LPG, diesel and the two petroleum-fueled hybrid-electric vehicles (HEVs) offer moderate GHG reductions on the order of 10-35%. In contrast to the biomass-based E85 pathways, emissions for the corn-based E85 pathway are only moderate due to the fact that ethanol plants rely on coal and natural gas for process energy. More intensive use of agricultural chemicals (including nitrogen fertilizers which result in emissions of the potent GHG, N2O) also diminishes the GHG reductions achieved by the corn-based E85 pathway. Finally, it must be noted that the electrolytic hydrogen pathways are the only alternative pathways that result in increased GHG emissions. In fact, these pathways result in significant increases of approximately 40-80%, despite the fact that hydrogen itself is a carbon-free fuel and hydrogen fuel cell vehicles (FCVs) result in zero emissions of GHGs during vehicle operation. This is due to the GHG-intensive nature of the current coal-dominated U.S. electricity mix and the low WtP efficiency of electrolytic hydrogen production. As such, it may be unwise to adopt the widespread use of the electrolytic hydrogen pathways, as the world cannot afford increased GHG emissions. However, WtW GHG emissions for these pathways are highly dependent on the electricity mix. Thus, electrolytic hydrogen may be acceptable in regions with electricity mixes resulting in low GHG emissions (i.e., California or the Pacific Northwest) and is excellent when specifically utilizing renewable energy (as is evidenced by the remote renewables-to-hydrogen pathways). This study indicates that, in general, alternative transportation fuels and vehicle propulsion systems help reduce criteria pollutant emissions associated with the light-duty transport sector. In particular, all but one of the alternative pathways results in some decrease in urban emissions of the five criteria pollutants (with the exception being urban NOx emissions from the LSD pathway). However, several pathways result in increased total emissions of one or more criteria pollutants. The electricity-based pathways result in increased PM10 and SOx emissions, for example. Additionally, the ethanol from farmed crops pathways result in increased emissions of NOx and in the case of corn ethanol, a large increase in total PM10 emissions, both due to farming activities. The criteria pollutant results thus point to the fact that trade-offs may be necessary, as several pathways that perform well in all other metrics result in increases in total emissions of one or more criteria pollutants. This study’s results also point to the importance of upstream stages to WtW criteria pollutant emissions. Thus, in many cases, future efforts to reduce transportation-related criteria pollutant emissions may be forced to focus on WtP stages, rather than on vehicle tailpipe emissions (which have been the focus of increased regulation in the past few decades). Considering this study’s primary motivations, the WtW results generated by this study provide cause to be optimistic. 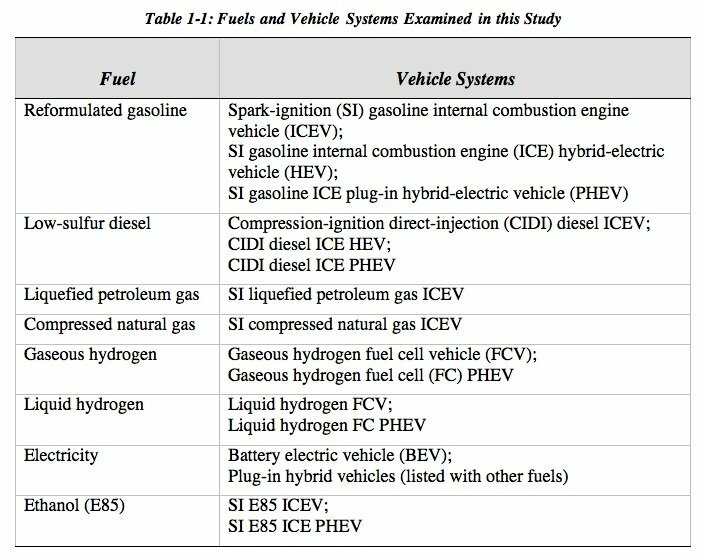 This study demonstrates that there are several potential alternative vehicle fuels and propulsion systems that can significantly decrease petroleum energy use. The results also indicate that there are several promising options to drastically reduce GHG emissions related to the light-duty transport sector as well as emissions of several criteria pollutants. Care must be taken, however, to avoid simply substituting non-North American natural gas for petroleum use, lest the United States end up embroiled again in the negative consequences arising from reliance on a depleting energy source. Alterative fuels that rely on domestic energy sources should be preferred and renewable resources should be utilized as much as possible. Some of the technologies and fuels analyzed in this study are ready and available today to contribute immediately to reducing petroleum and fossil energy use and emissions of GHGs and criteria pollutants. Other technologies still have unresolved technological, cost, or other hurdles and may require additional research and financial support to reach the market quickly enough to take full advantage of their potential benefits in the timeframe considered by this study (i.e., by 2025). The results presented in this study can be used as an initial indication as to which technologies should receive the most concerted effort to bring to market. Plug-in hybrid electric vehicles, ethanol derived from woody and herbaceous biomass (i.e., cellulosic ethanol) and electric vehicles all offer a particularly good range of benefits. The pathways utilizing remote stranded renewables offer by far the best benefits, although developing these resources would require large capital investments and considerable planning. In short, this study finds that the technical options are available to allow significant reductions in petroleum and fossil energy use as well as emissions of GHGs and criteria pollutants related to the light-duty transport sector. What is needed is the development of forward thinking strategies and actions to begin a concerted and rapid transition away from the current oil-addicted light-duty transport sector towards the use of vehicles fueled with energy derived from domestically available and, as much as possible, renewable energy sources. Such vehicles and fuels could also offer dramatically reduced emissions of GHGs and pollutants. This study indicates that the requisite options are available. We must now chart the road forward. Finally, for those of you interested in research in this area, I included a large annotated bibliography that should be useful. I recently attended the Ocean Renewable Energy Conference in Newport, OR, on July 14th. The conference was almost entirely focused on wave energy and was centered around the theme of 'what would it take to make Oregon the North American leader in wave energy - both in installed wave energy facilties and as home to a new wave energy industry. [OPT's plans for a Reedsport wave energy park was a frequent topic of discussion at the conference, of course - see recent post]. The conference recieved a good showing - at least 100 people were in attendance - for a technology and industry as nascent as wave energy. The conference felt like what a conference on wind energy must have felt like 20 years ago. A strong and broad stakeholders group, known as the POWER group (People of Oregon for Wave Energy Resources) has been assembled and has been meeting in Oregon for the past year. The POWER group was instrumental in making the conference happen. And, perhaps most importantly, how do we actually permit and site a wave energy facility in the United States? - it's never been done before, and there's a whole rats nest of federal, state and local agencies that will have some say in the siting process; FERC will generally be the lead if the facility is located in state territorial waters (<3 miles from shore), while the federal Minerals Managament Service (MMS - the guys in charge of siting offshore oil and gas rigs) takes the lead if the wave park is outside state waters (>3 miles offshore) or in a national wildlife refuge. A number of other agencies will have a part of play as well. The Reedsport wave park [see previous posts here and here], which could be the first commercial-scale wave facilty in North America. This project (as discussed above), would feature Ocean Power Technology's PowerBuoy wave energy converters and we be located offshore of Reedsport and the mouth of the Umpqua River. The Reedsport site is a prime location for wave energy development because it has an excellent wave resource, and because of old paper mill site near Reedsport left behind an existing power substation with capacity for 50 MW as well as a three kilometer underwater effluent pipeline that can be used to run underwater power cables from the wave park to shore. The Reedsport OPT project would start with a 2 MW pilot-scale installation, most likely consisting of 13-14 of OPT's 150 kW PowerBuoy's. The second phase would be commercial-scale and be up to 50 MW, potentially using the larger 500 kW version of the PowerBuoy that OPT is planning to develop (every doubling in diameter of the power conversion device quadruples the amount of wave energy captured, meaning a wave energy has a very strong economy of scale similar to that for wind power). Central Lincoln County Public Utility District is supportive of the project and has said they would purchase power from the Reedsport wave park. OPT is also planning a 1.5 MW project off the coast of Spain as well as a 2-5 MW project in France (in partnership with Totale) and a potential project in southwest England. A National Wave Energy Research Center, located in Newport, Oregon, has been proposed, and Oregon State University has been pushing for federal funding for the center. The center would likely be modeled after wave energy research centers like the EMEC facility in Orkney (UK). The center would also include state-of-the-art onshore research laboratory facilities to enable research and development of wave energy conversion devices, long-lasting marine materials, etc. OSU has been doing cutting-edge research on wave energy conversion devices and would run the National Wave Energy Research Center. (They have also been involved in the Reedsport project). AquaEnergy (Aqua) has been working for several years on a 1 MW pilot project in Makah Bay, Washington. Aqua applied for a permit for the project in 2002 and has been undergoing the FERC Alternative Licensing Project (although the passsage of the Energy Policy Act of 2005 may change juristiction to MMS). Clallam Public Utility District has partnered in the process and has said they would purchase power from the facility. The Makah facility is located in the northwestern-most tip of the continguous United States, 3.2 miles offshore from the Makah Indian Reservation on Washington's Olympic Penninsula. Transmission lines run just onshore, allowing easy grid interconnection. The facility would be located in a marine wildlife refuge, so obviously, extensive environmental impact studies are being carried out. The Makah Bay facility would utilize Aqua's AquaBuOY wave energy converters. It will be a while before any of these projects get in the water. Being the pioneers through the permitting process for the first wave energy facilities in the U.S. is a thankless job, and it will be a long process. Being the first means you've got a lot of things to demonstrate - enviromental impact, impact on local fisheries, reliability of your devices and the power it generates, etc. - before you'll get your permit, and (judging from the presentations at the conference) it will be at least 2 years before even a pilot-scale project is in the water. It will probably be 4-5 years or more before we see an operational commercial-scale wave energy facility. Still, if wave energy can follow the same exponentially decreasing price curve that the wind industry has realized, we could be looking at an excellent new renewable energy source that we can add to our portfolio of diversified, clean, and domestic energy resources. [EDIT - 8/4/06] The presentation from the conference are now available online to download, if you are interested: conference presentations. News From My Backyard: Application Filed for Reedsport, OR Wave Energy Park - First Commercial Wave Energy Project in U.S.
As part of the initial program for the OPT Wave Park to be located at Reedsport, OR, the company expects to install its ocean-tested PowerBuoys approximately 2.5 miles off the coast at a depth of 50 meters initially generating a total of 2 MW. Approval for the full-scale 50 MW wave power plant will follow completion of the initial 2 MW program. "This application to FERC represents a major step in the development of OPT's wave power projects in the U.S. for large-scale electricity generation," said George Taylor, Chief Executive Officer of OPT. "When completed, this plant will provide renewable power into the grid supplying the West Coast of the U.S."
The company has already consulted key stakeholder groups about its plans and will continue to work closely with these groups over the initial stages of the project. According to the company, a key strength of the PowerBuoy system is its compact nature and low visual impact. OPT's wave energy converter consists of a vertically oriented column or cylinder that absorbs the rising and falling motion of ocean waves to cause the buoy mechanics to move freely up and down. This movement in turn drives an electric generator that creates usable on-site power or power that can be cabled away to a nearby mainland location. OPT's PowerBuoy technology was cited in recent U.S. Congressional hearings in support of increasing funding for ocean energy demonstration programs. U.S. Representative Inslee (D-Washington) proposed an amendment to the Deep Ocean Energy Resources (DOER) Act, which would increase the funding for ocean energy demonstration programs from $6 million to $20 million per year. The Congressman also specifically cited the technology being offered by OPT. The Reedsport wave park [see previous post], which could be the first commercial-scale wave facilty in North America. This project (as discussed above), would feature Ocean Power Technology's PowerBuoy wave energy converters and we be located offshore of Reedsport and the mouth of the Umpqua River. The Reedsport site is a prime location for wave energy development because it has an excellent wave resource, and because of old paper mill site near Reedsport left behind an existing power substation with capacity for 50 MW as well as a three kilometer underwater effluent pipeline that can be used to run underwater power cables from the wave park to shore. 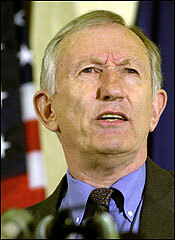 Sen. Jim Jeffords (I-VT), ranking member of the Senate Environment and Public Works Committee, introduced sweeping legislation that - if enacted - would for the first time set the U.S. on a path to decrease and, in time, reverse the emissions of greenhouse gases that cause global warming. It also includes, among other measures, a national renewable energy mandate and aggressive national energy efficiency standards. "The science is clear, mankind is heating the planet in a manner that is destructive," said Jeffords, who called upon the United States to take its rightful place as a world leader. "We can no longer afford to watch from the sidelines. We are a nation of innovators, and we have the skills to develop the technology to make these needed changes." Requires that the U.S. reduce its emissions between 2010 and 2020 to 1990 levels. By 2030, the U.S. must reduce its emissions by 1/3 of 80% percent below 1990 levels; by 2040 by 2/3 of 80% percent below 1990 levels; and by 2050, to a level that is 80 percent below 1990 levels. Requires that power plants, automobiles and carbon-intensive businesses reduce their global warming pollution. In the event that global atmospheric concentrations exceed 450 parts per million or that average global temperatures increase above 2 degrees Celsius (3.6 degrees Fahrenheit) above the pre-industrial average, EPA can require additional reductions. Provides for standards and grants for sequestration of greenhouse gases. The National Academy of Sciences will report to EPA and the Congress to determine whether goals of the Act have been met. Requires the U.S. to derive 20% of its electricity from renewable sources by 2020. Establishes energy efficiency standards similar those found in California and ten other states. "This legislation is a flexible and forward-thinking approach to combating the threat of global warming. Senator Jeffords has laid down an important marker for us to work toward, so that our children and our grandchildren will see that we had the wisdom and leadership to choose a better path for our world," said Senator Barbara Boxer (D-CA), the bill's lead co-sponsor. Senators joining Jeffords and Boxer as original co-sponsors are Senators Frank Lautenberg (D-NJ), Edward M. Kennedy (D-MA), Patrick Leahy (D-VT), Jack Reed (D-RI), Daniel Akaka (D-HI), Chris Dodd (D-CT), Paul Sarbanes (D-MD), and Robert Menendez (D-NJ). Well, this is just about the full laundry list of all the things I'd like to see passed at the federal level - well it's missing any serious measures addressing the transportation sector (i.e. increasing fuel economy standards, etc.) which would be necessary to actually achieving the GHG reduction targets. Of course, this bill will probably never move out of committee. The list of sponsors seems like all the usual dems, but without any republicans supporting it, it is unlikely to go anywhere. Plus, it's asking for quite a lot in one package - probably because Jeffords et al. know it doesn't really have a chance of passing anyway. If Jeffords was really interested in getting legislation passed (at least in the current political climate) he'd try just one or two of these measures on their own. Long known as a top oil- and natural gas-producing state, Texas now has another energy title under its belt: the nation's top producer of wind energy. Texas installed wind power capacity now stands at 2,370 megawatts (MW), enough to power 600,000 average-sized homes a year, according to a midyear report released Tuesday by the American Wind Energy Association (AWEA). 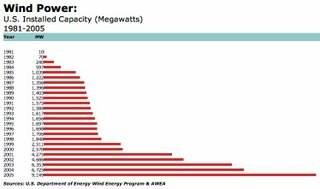 That puts Texas slightly ahead of California (with 2,323 MW of capacity), the nation's leader since 1981. The total U.S. capacity is now 9,971 MW, according to an Associated Press article [via Environmental News Network]. So far this year, Texas has added 375 MW, which makes up 46 percent of the total 822 MW brought online nationwide, AP reports. Last year, wind energy generation grew 35 percent nationwide, adding 2,431 MW, falling a bit short of the projected 2,500 MW. The wind association believes it can add 3,000 MW nationwide this year, even if that means another 2,178 MW by year's end. "There are substantially more developments in the pipeline," said Randall Swisher, AWEA's executive director. "We are just about where we thought we would be in terms of appearing to be on course for another industry record for the year." In addition to significant statewide developments, Texas has signed two agreements since last fall with developers to build offshore wind farms along the Gulf Coast [see previous post]. 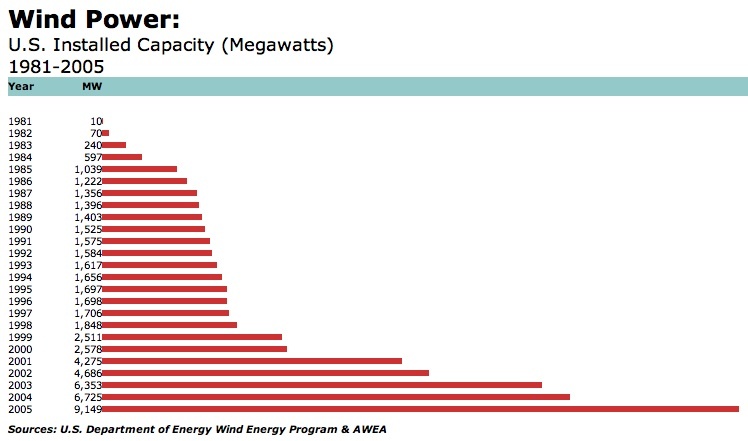 Wind energy, however, still has a long way to go before it's considered conventional rather than an alternative. It makes up about 1 percent of the nation's electricity, AP reports. To become an attractive investment, wind farm developers often rely on federal tax credits. For the next 18 months, projects coming online receive the federal Production Tax Credit (PTC) - recently extended to 2007 in the Energy Policy Act of 2005 - amounting to 1.9 cents per kilowatt hour of wind energy produced by the project. Those incentives are good for the first 10 years of production. But there is no guarantee that any projects completed after 2007 will receive those tax credits and that discourages long-term development, energy officials said. The start and stop history of the PTC - which has repeatedly expired and been reinstated over the past several years - has created a cycle of boom-and-bust in the wind industry. Energy consultant Bruce Bailey is optimistic though, that some kind of subsidy will be available after 2007. Bailey, who is president of AWS Truewind LLC in Albany, N.Y., said federal lawmakers are becoming increasingly more bullish on this renewable energy and won't likely let it expire without an extension. The Bishop of London has declared it sinful for people to contribute to climate change by flying on holiday, driving a “gas-guzzling” car or failing to use energy-saving measures in the home, according to the Times of London. Chartres, the third most senior bishop in the Church of England, has declared his views as the church prepares to publish Treasures on Earth, a booklet on environmental matters to be sent to every diocese for distribution, the Times reports. According to the Times, the forthecoming booklet will say that scientific research supporting predictions that the earth faces serious climate change is “overwhelming”. It will also detail practical ways for Christians to cut their carbon emissions, at church and at home, including trying to walk or cycle to communion. The church’s advisers on the environment say that offsetting your carbon dioxide emissions against “green” actions such as planting trees is a first step towards becoming sustainable but is not a long-term answer. Under Chartres, the church has commissioned briefings on climate change, plus examples of green sermons, available on the internet, to help vicars master the facts when writing their homilies. As dean of the chapels royal, Chartres also oversees churches used by the royal family and so is in regular contact with the Queen, the head of the church, and the Prince of Wales, the Times reports. A church spokesman confirmed both had supported Chartres’ initiative. The church is taking steps to improve its own environmental record and has asked vicars to carry out an energy audit so they can reduce their “carbon footprint”. The church has a bit of a challenge, however, as it owns some of the largest and draughtiest buildings in Britain, including medieval cathedrals, gothic churches and ageing parsonages. They'll try their best, though. “We have no right to appeal to our contemporaries on this issue if we have failed to put our own house in order,” said Chartres. Lambeth Palace, Archbishop Williams’ residence, has been audited, for example - and was criticised for using inefficient light bulbs rather than the low-energy alternatives. The Church of England is not alone amongst Christian organizations calling on their members to get serious about climate change. Earlier this year, a large coalition of 86 evangelical Christian leaders in the United States decided to back a major initiative to fight global warming as well [see previous post]. Again, as I said after reporting on the coalition of evangelicals, having spiritual leaders stand up and get serious on climate change is great news. These are very influential people whose opinions sway those of thousands of normal folks. To have them throw their support behind climate change mitigation may go along way towards shifting the mindset of Joe and Jane Average towards believing that climate change is a real issue that deserves attention from thair political leaders. After all, it's getting attention from their spiritual leaders. Brazilian automotive company OBVIO! will develop and introduce lithium-ion-powered electric cars based on its 828 and 012 microsport car designs (earlier post) for export to North America. OBVIO! has a strategic partnership with California automobile distributor ZAP (who also markest the Smart Car in North America), which has agreed to be the exclusive North American distributor and has pre-purchased 50,000 OBVIO! units. The initial versions of the 828 and 012 car designs will be flex-fueled, and will go into production in 2007. The 828E and 012E - the EV versions of OBVIO! 's two models - will not be far behind, according to OBVIO! President Ricardo Machado. It is clear to me that electricity has a big future in the auto industry. OBVIO !’s business model of 100 percent outsourced supplier relationships allows for the speed and flexibility to incorporate a new drive system powered by electricity by our second model year. The preliminary specifications for the OBVIO! electric cars include a range of 200 to 240 miles, with acceleration from 0 to 60 mph of less than 4.5 seconds and a top speed of 120 mph. A 39 kWh lithium-ion battery system will power the 120 kW (160 hp), 220 Nm (162 lb-ft) electric motor. A full normal recharge will take five hours, with a fast charge taking two hours. A 30-minute quick charge will provide a 20 to 50 mile range. OBVIO! is also providing a bi-directional vehicle-to-grid (V2G) interface. Target prices for the 828E and 012E are $49,000 and $59,000 respectively. Ask Detroit about batteries for electric vehicles and they'll probably tell you they're just not ready yet. But hey, what the heck does Detroit know about batteries, anyway?! That's what Silicon Valley electrical engineer Martin Eberhard asked himself when he found out he couldn't buy a sports car that delivered both good mileage and snappy performance. It seems that fuel economy and high performance are mutually exclusive, at least for in the internal combustion engine world. After a little research on alternatives, Eberhard found out that electric vehicles can deliver both efficiency and performance. The only problem: nobody's making them. What's a boy to do? Well, if you're an electrical engineer with experience eaking every last drop of power out of lithium-ion batteries to maximize runtime on electrical gadgets - and you've got the backing of backing of some of Silicon Valley's big names - you simply go ahead and found Silicon Valley's first real auto company - Tesla Motors - and design your own high-performance EV: the Tesla Roadster. Eberhard's central concept in founding Tesla Motors, back in July 2003, is that there is no need to reinvent the battery, particularly for a product with a small initial market. Eberhard simply adopted the lithium-ion technology used in laptops and harnessed the momentum of the computer industry. Let Dell, HP, and the rest of the sprawling PC business, with their billions of R&D dollars, do the hard work of extending battery life and driving down prices. He'd piggyback on their innovations. Meanwhile, automakers had been doing their own R&D, dismantling some of the biggest barriers to entering the business. To lower production costs, the Big Three had outsourced much of their parts manufacturing over the past 25 years. An upstart like Tesla Motors can now buy just about everything it needs to mass-produce a car from independent suppliers. A fledgling electric car company had other advantages, too: Tighter emissions standards have raised the cost of developing gas-powered cars, and buyers of low-emission vehicles are lured by big tax breaks. So, after pounding the pavement and securing some venture capital from several tech industry notables - PayPal cofounder Elon Musk, Google's Larry Page and Sergey Brin, and ex-eBay chief Jeff Skoll all chipped in to fund Tesla Motors - Eberhard went to work securing contracts for parts and manufacturing with established businesses - including British sports car manufacturer, Lotus. For the past three years, Tesla Motors ran in stealth mode. Because electric cars had failed so visibly in the late '90s, the company knew it faced a tough marketing challenge, and Eberhard didn't want to show the world something half-baked. If Tesla was to succeed, it would need to present a fully realized, radically different approach. Luckily, there was little threat of car spies ruining the surprise. "Silicon Valley is a great place to run a secret car company," Eberhard says. "Nobody expected something to sprout up in Northern California, so no one came looking." 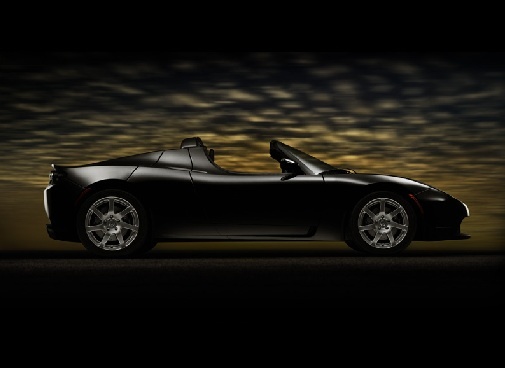 The result of all those years of stealthy work: the Tesla Roadster, a lithium-ion battery powered sportscar featuring a 248 hp (185 kW) electric motor that takes the light-weight roadster from 0 to 60 in under four seconds. The Roadster has a top speed of 130 mph and - thanks largely to it's lightweight and aerodynamic design - has a range of 250 miles off it's array of 6,831 off-the-shelf lithium-ion cells. When connected to a special 220-volt, 70-amp outlet, recharging takes about three and a half hours. The Roadster's 3-phase, four-pole motor uses a low resistance “squirrel cage” with large copper end rings. This design allows the rotor to develop high current flows and torque, with low resistance losses. The use of a small air gap allows tight inductive coupling which, combined with low loss magnetic materials, enables the development of high torque at high rpm. Together, these factors allow the induction of large currents, even at high rpm, producing much flatter power and efficiency curves from approximately 2,000 rpm to 12,000 rpm. The motor redlines at 13,500 rpm allowing the car to run at 70 mph in first gear! The car has only two gears, plus reverse. Tesla Motors will be selling the car for $80,000-100,000 - in the range of a Porsche 911 Carrera S.
Of course, an expensive two-seater isn't going to have much effect on an industry that sells 17 million automobiles in the US each year. As Wired Magazine points out, "Sure, every VC will have to get one, and George Clooney will probably be seen piloting one down Sunset Boulevard. But selling a few thousand cars won't help Eberhard build a dominant 21st-century car company." That's why Eberhard is already preparing a four-seater sedan, codenamed White Star, which could hit streets as early as 2008. Of course, the sedan won't be as lightweight or aerodynamic as the Roadster, so we might expect it's range to drop significantly. Eberhard's response: maybe with today's tech. But battery power is improving steadily, he points out, and several companies say they may soon double battery life. By the time the sedan comes out, he says, batteries will be ready to deliver: "We're going to ride that technology curve all the way home." In a white paper (The 21st Century Electric Car) published on the Tesla Motors website, the company calculates explores the 'well-to-wheel' and 'tank-to-wheel' efficiencies of their Roadster compared to competitors - both for in the fuel economy and high performance worlds. According to the White Paper, the tank-to-wheel - or vehicle fueling and operation - energy efficiency of the Roadster is 2.18 km/MJ, or the equivalent of 135 mpg. Assuming electricity supplied from a combined-cycle natural-gas-fired generator, and accounting for transmissions losses over the grid leads them to calculate the “well-to-wheel” - or full fuel cycle - efficiency of the Roadster to be 1.14 km/MJ - double the efficiency of the Toyota Prius! Tesla then tackles the question of hydrogen fuel-cell vehicles (FCV), deriving a theoretical efficiency for an FCV fueled with hydrogen produced by steam methane reforming of 0.85 km/MJ - better than gasoline cars, but 32% worse than Tesla's Roadster. ...The best fuel-cell demonstration car measured by the EPA is the Honda FCX, which gets about 49 miles per kilogram of hydrogen, equal to 80.5 kilometers per kilogram. We know that the energy content of hydrogen is 141.9 MJ/kg, so we can calculate the vehicle efficiency to be 80.5 km/kg / 141.9 MJ/kg = 0.57 km/MJ. ...When we calculate the well-to-wheel energy efficiency of this Honda experimental car, we get 0.57 km/MJ x 61% = 0.35 km/MJ, not even as good as the ordinary diesel Volkswagen Jetta, let alone the gasoline-powered Honda Civic VX or the Honda Insight hybrid car. However, some proponents of hydrogen fuel cells argue that it would be better to produce hydrogen through electrolysis of water. The well-to-tank efficiency of hydrogen made through electrolysis is only about 22%, and the well-to-wheel energy efficiency of our theoretical fuel-cell car would be 2.78 km/MJ x 50% x 22% = 0.30 km/MJ, and the well-to-wheel energy efficiency of the Honda FCX would be 0.57 km/MJ x 22% = 0.12 km/MJ, even less efficient than a Porsche Turbo. 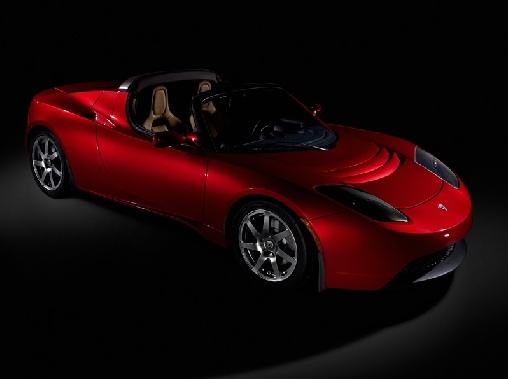 Tesla Motors website - lot's of pictures of the Roadster and more info here. Wired article: Battery-Fueled Car Will Smoke You - July 19th, 2006. - there's more pictures here too. According to an article in today's New York Times, the United Nations has now reported that an average of more than 100 civilians per day were killed in Iraq last month, bringing the monthly total to over 3,000 civilians killed, the highest monthly tally of violent deaths since the fall of Baghdad. The death toll, drawn from Iraqi government agencies, was the most precise measurement of civilian deaths provided by any government organization since the invasion and represented a dramatic increase over daily media reports, the NY Times reports. This sharp upward trend reflected the dire security situation in Iraq as sectarian violence has worsened and Iraqi and American government forces have been powerless to stop it. Underscoring the report, a suicide bomber attacked a marketplace in the southern Shiite holy town of Kufa today, killing 53 people and wounding at least 105, according to local hospital officials. Kufa is a stronghold of Moktada al-Sadr, the powerful Shiite cleric who counts an enormous following among the Shiite poor and dispossessed in Baghdad and southern Iraq. The militia loyal to him, the Mahdi Army, has been blamed for many recent kidnappings and assassinations of Sunni Arabs. Kufa and the nearby Shiite holy city of Najaf — because of their vastly Shiite populations and tight control by Shiite militias and the Shiite-dominated security forces — have been largely spared the sort of sectarian violence that has ravaged mixed cities like Baghdad and Baquba. But today’s attack, coupled with several other recent suicide attacks in both cities, suggested an ominous deterioration in security even in Iraq’s demographically homogenous populations. Model year [MY] 2006 vehicles offer an average estimated fuel economy rating of 21.0 mpg. This average is the same as last year and in the middle of the 20.6 to 21.4 mpg range that has occurred for the past fifteen years, and five percent below the 1987 to 1988 peak of 22.1 mpg, according to the EPA’s just-released report, Light-Duty Automotive Technology and Fuel Economy Trends: 1975 Through 2006. Green Car Congress [GCC] reports that MY2006 light-duty vehicles are estimated, on average, to be the heaviest, fastest and most powerful vehicles than in any year since EPA began compiling such data. A period of relatively constant overall fleet fuel economy. After two decades of constant growth, light truck market share has been relatively stable for five years, and represents about 50% of the total market, GCC reports. Growth in the light truck market was primarily due to the increase in the market share of SUVs, which increased their share by more than a factor of ten, from less than two percent of the overall new light-duty vehicle market in 1975 to more than 25% of vehicles built each year since 2002. 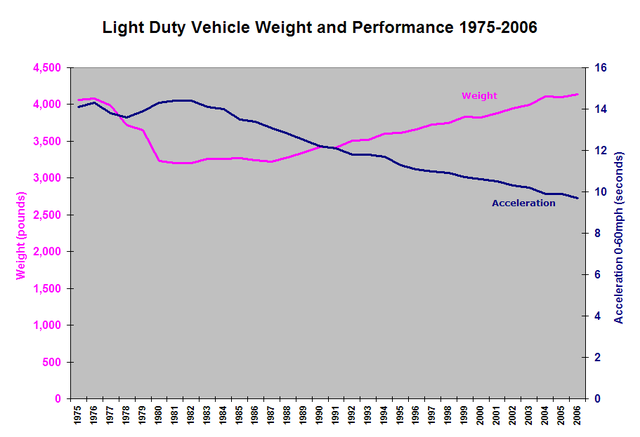 For obvious reasons, the increased market share of light trucks, which in recent years have averaged more than 6 mpg less than cars, accounted for much of the decline in fuel economy of the overall new light-duty vehicle fleet from the peak that occurred in 1987-88. Improved engine, transmission, and powertrain technologies continue to penetrate the new light-duty vehicle fleet every year. However, the trend has clearly been to apply these innovative technologies to accommodate increases in average new vehicle weight, power, and performance while maintaining a relatively constant level of fuel economy [see graphic below]. 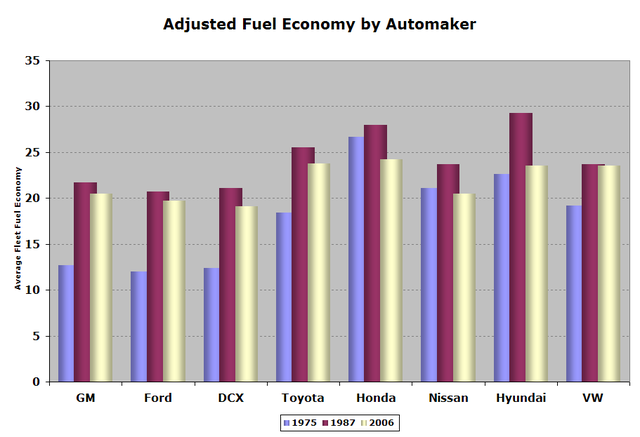 At the peak of industry-wide fuel economy in 1987, some automaker groups had average fuel economies 6 to 8 mpg higher than others. In MY 2006, the gap has decreased to a maximum difference between automakers of an estimated 5 mpg, with a typical difference between higher and lower fuel economy marketing groups being 3 to 4 mpg, GCC reports. For MY2006, Honda, Toyota, Hyundai, and Volkswagen all have estimated fuel economies of 23.5 to 24.2 mpg, while General Motors, Nissan, Ford, and DaimlerChrysler all have estimated fuel economies of 19.1 to 20.5 mpg. 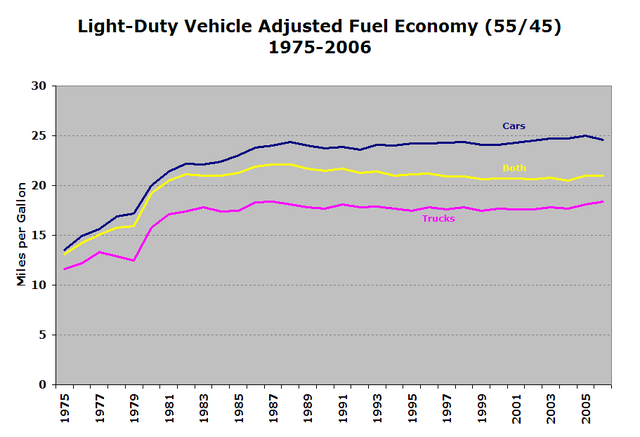 Each of these groups has lower average fuel economy today than in 1987 [see graphic below]. The fuel economy values in the report are based on “real world” estimates provided by the Federal government to consumers and are about 15% lower than the values used by manufacturers and the Department of Transportation (DOT) for compliance with the Corporate Average Fuel Economy (CAFE) program. Because it has been more than two decades since the current procedures for determining real world fuel economy estimates were established and because both vehicle technology and vehicle driving patterns have changed, EPA has proposed changes to the methodology for calculating real world fuel economy estimates and expects to finalize a new methodology by the end of 2006. Light-Duty Automotive Technology and Fuel Economy Trends: 1975 Through 2006"
Syntec Biofuels, a spin-off from the University of British Columbia, is gearing up to enter the second-generation biofuels market with a set of proprietary catalysts that produce ethanol from the syngas resulting from the gasification of biomass, according to Green Car Congress [GCC]. Established as a research company at the University in 2001, Syntec was recently acquired by NetCo Investments, which promptly changed its name to Syntec Biofuels, GCC reports. In 2004, Syntec filed a patent for its first ethanol catalyst, which contained precious metals. The company expects to file a second patent for its commercial variant - based on non-precious metals - by year’s end. In parallel, Syntec Biofuel will commission its first bioreactor for the production of bio-methanol - a facility that will utilize the same production methodology as its biomass-to-ethanol process. This will also serve as a test bed for commercial-scale testing of Syntec’s proprietary ethanol catalyst, while generating revenue for the company from the production of bio-methanol. Syntec’s process consists of a thermochemical conversion of synthesis gas (syngas) into ethanol in a bioreactor containing a catalyst. Syngas is a mixture of carbon monoxide and hydrogen that can be derived from any carbonaceous material including: natural gas, coal bed methane, landfill gas, digester gas and biomass gasification. Syntec believes that its patented technology will provide it with the leading production process for achieving high ethanol yields from biomass and it expects its costs to be much lower than those of conventional ethanol fermentation processes that use sugar and starch crops as feedstocks. Relatively few studies have been done on selective catalytic synthesis of ethanol from syngas, according to Syntec. Moreover, it is the lack of selective ethanol catalysts and poor conversion ratios that have prevented the commercial realization of chemical production of ethanol according to the company. Syntec anticipates that once perfected, its catalyst will enable the ethanol industry to use this well established chemical process to obtain production and efficiency metrics beyond what traditional grain based fermentation processes can offer. Unlike bacteria, enzyme, and acid or other solvent-based processes which are usually particular about their feedstock, the Syntec’s low-pressure thermochemical process can use a wide variety of feedstocks, given appropriate modifications in the syngas production step. These gasification-based biomass-to-ethanol process are very promising, in my opinion, as they offer very high yields, co-produce a considerable amount of electricity, and are tolerant of a variety of feedstocks (with a bit of tweaking to the preprocessing stage). This speech is a few weeks old now, but I just read it again for the second time, and I decided that it was worth posting here for those of you who haven't seen it yet to read. 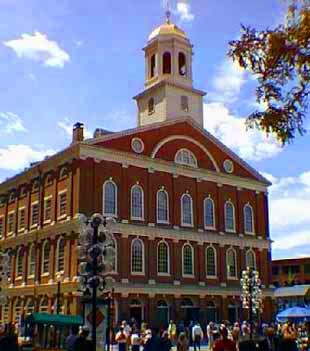 "Here in Faneuil Hall, America's first great gathering ground of free speech and dissent, we came together two months ago and nearly two and a half centuries after the voices of patriots were first heard within these walls. We came together to affirm that the patriotism of 2006, no less than the patriotism of 1776, demands that we speak truth to power - that for love of country, we must end a war in Iraq that kills too many of our sons and daughters, betraying both our national interests and our ideals. Last week, in the Senate, we stood against appeals to politics and pride and demanded a date to bring our troops home. We did that because that's the way you get Iraqis to stand up for Iraq and fight a more effective war on terror. We defied the White House tactics of fear and smear. Presidents and Republican politicians may be concerned about losing votes or losing face or losing legacies. We told the truth because we are more concerned about young Americans and Iraqi civilians losing their lives. And I guarantee you, our success would bring less loss of life, less expenditure of dollars, and it would make America safer. I say "we" because even though our resolution only won 13 votes this time, I know every minute of the debate you were there with us -- there with Russ Feingold, there with Ted Kennedy and there with us as we voted our beliefs and yours - that a policy based on deception and filled with blunders is no excuse for its own perpetuation. But while we lost that roll call, I guarantee we will win the judgment of history because Washington is wrong and Americans are right, and we must set a new course in Iraq. Yet our challenge is not just to end this war, it is to prevent the next one. The arrogance of ideology and the willful ignorance of the intelligence led us into a war of choice in Iraq. Now we must act so that at some future date America will never have to fight for its economic security because we are permanently held hostage to foreign oil. We must make the hard choices - about alternative energy and clean coal, conservation and fuel efficiency - that will free our future from the dominance of big oil and yesterday's fossil fuels, a dominance that in the era of global warming threatens the future itself. "So I come here again to Faneuil Hall, which is also the cradle of American independence, to set out a strategy for energy independence. To propose specific steps for an energy revolution as far-reaching as the industrial revolution. And to oppose the procrastination, the Washington evasion and the Cheney-run secret task forces by and for big oil. "How insulting and ridiculous it is to be told that the solution to our problems is to drill in and destroy the Arctic National Wildlife Refuge that would yield a few months of oil when we are already importing 60 percent of our oil and climbing? God only gave us 3% of the world's oil reserves. There is simply no way to drill our way out of our problem. We have to invent our way out. "To do that, we also have to invent our way out of the politics of greed and empty posturing that has worsened our dependence and denied the undeniable and potentially disastrous effects of global warming. "Not long ago, in the face of record gas prices, a volatile Middle East, and hostile rhetoric from a fundamentalist regime in Iran, a President of the United States asked "Why have we not been able to get together as a nation to resolve our serious energy problem?" "His name was Jimmy Carter - and that steamy summer of 1979 seems as familiar today as the question he raised then. Almost twenty seven years later we face another summer of record gas prices, raging violence across a volatile Middle East, renewed rhetoric of hate from a fundamentalist regime in Tehran. Our national neglect has made the quarter of a century since then what Winston Churchill called "years the locust has eaten." Today we endure another summer of record gas prices; we witness the violence raging across a volatile Middle East; and we hear the rhetoric of hate from a hostile government in Tehran. "George W. Bush now says that "America is addicted to oil." His preferred policy has been to feed the addiction; his attitude on greenhouse gases is to let them increase; his energy alternatives are token; again and again his approach to crisis is to denigrate the environment. Mr. President, the people know the truth: America is not addicted to oil because it wants to be. Washington is addicted to oil because that's the way powerful interests want it to be. "And it has been this way ever since President Nixon announced a national goal that by 1980, "the United States will not be dependent on any other country for the energy we need." President Ford extended the deadline: energy independence by 1985. Come 1985 President Reagan was promising to "ensure that our people and our economy are never again held hostage by the whim of any country or cartel." "The bottom line - whenever we face an energy crisis, talk of energy independence becomes the common currency of the American political dialogue. We have Apollo projects and Manhattan Projects for alternative fuels; summits and conferences and energy expos. And then, as the price of oil falls or supplies increase or a war is put behind us, the sense of urgency evaporates. "Too often our leaders in both parties have done what's easy, turned their backs on hard realities and great possibilities. Renewables, efficiency breakthroughs, clean technologies have been marginalized in the face of self-interested forces. "In these lost years, we could have created millions of new jobs, opened up vast new markets, improved the health of our citizens, slowed global warming, saved the taxpayers money, earned the respect of the world, and significantly strengthened our long term security. Instead America's energy strategy has been rhetorical, not real. "For evidence, look no further than the fake energy bill Congress enacted over bipartisan objections - a monstrosity with no guiding national goal, no tough decisions, no change in priorities - just a logrolling, back-scratching collection of subsidies for any industry with the clout to get a seat at the table and a share of the pork. A few good ideas, a lot of bad ideas and ugly ideas - Washington smiled equally upon all of them. "I don't know how to say it more plainly: Washington's energy policy is as real as their claims of Mission Accomplished in Iraq. But it is also the latest chapter in the long story in both parties politics at its worst - ducking the difficult choices, giving into the big contributors, substituting words for deeds, postponing the reckoning until the day after tomorrow. If you offend no one, you change nothing. The world is changing and now the reckoning is real. "Last Thursday, Brian Williams opened the nightly news with a stark statement: "Top climate scientists are saying with a high level of confidence that the earth is the hottest it has been in 400 years." NBC's science correspondent reported that global warming may lead to "rising sea levels, heavy rains in some areas, drought in others, and an increase in severe weather, including hurricanes." Was there room to argue? Well, as the NBC story concluded "you can [always] make a debate if you can find one scientist who says the earth is flat and have him debate it against everybody else." "Well, Washington is full of "flat-earth" politicians. No matter how the evidence has mounted over two decades -- the melting of the arctic ice cap, rising sea levels, extreme weather - the flat earth caucus can't even see what is on the horizon. In the Congress they've even trotted out the author of Jurassic Park as an expert witness to argue that climate change is fiction. This is Stone Age science. "Here's the bottom line: within the next decade, if we don't deal with global warming, our children and grandchildren will have to deal with global catastrophe. It is time to stop debating fiction writers, oil executives and flat-earth politicians, and actually take on the other mortal threat to America after terrorism, which, because of our oil dependence, is a decisive front in the war on terrorism. "We can't respond to climate change, and we can't wage and win a real war on terror if we don't at last take bold, real steps towards energy independence. For too long, we have allowed fundamental problems in the Middle East to fester by signaling corrupt Arab regimes that we don't care what they do so long as they keep the oil flowing. "So, energy independence is more than an important economic priority; it is an indispensable element of our national security. Our reliance on oil not only props up decaying and dictatorial regimes, but those that tolerate and sustain terrorist groups. Any long-term strategy for winning the war on terror must be matched with a determined effort to reduce our dependence on petroleum. It demands an international response, linked to the rapid emergence of new energy technologies, in order to ensure that emerging economies don't become the new enablers of Middle East autocrats. Make no mistake, our long term mission in the war on terror depends on long term energy independence. We must end the empire of oil. "For some, it may be hard to conceive of a world where fossil fuels, and especially petroleum, are not the dominant sources of fuel. "In fact, we've been here before. One hundred and fifty years ago in Massachusetts, in New Bedford and Nantucket, no one could conceive of a future that didn't depend on whale oil. But until recently, America's history has been to drive technology, transform marketplaces, and invent a future never imagined before. In America, making the impossible possible has been a credo and a way of life. In the 1930s only 10 percent of rural America had electricity. Utilities refused to wire rural counties because homes were too far apart. To bring electricity to all Americans, Congress provided more than $5 billion to finance rural electrification. By the 1950s, there was hardly a corner of America that was still dark. Across our history we've successfully moved from wood to coal, coal to oil, oil to a mix of oil, gas, coal, nuclear and hydroelectric. Now it's time to move to solar, wind, biomass, fuel cells, clean coal, and other wonders of American ingenuity, and I believe Washington must lead the marketplace in the right direction. "Today there is as compelling a national interest to address the security and environmental threats of fossil fuels as there is to defeat radical, extreme Islamists and global terror. Our soldiers shouldn't be the only ones to sacrifice in this war. We must all be soldiers, and we must all welcome some sacrifice in that service. "As individuals, the change can be as simple as replacing traditional light bulbs with efficient fluorescents. In our communities we should require that new buildings include lights that turn off when people leave the room. We should follow the lead of Tokyo and their energy efficient escalators that shut off when they aren't being used. There are literally thousands of things to be done, too few of which we are being asked to do. "Each of us can do something. And together all of us can insist on leaders who secure our energy independence, not ones who barter it away. We wouldn't elect a candidate who said terrorism wasn't a threat. We wouldn't tolerate a candidate for national office who didn't say he was committed to capturing or killing Osama Bin Laden. But for too long we've tolerated those who treat the threat of energy insecurity and the truth of global climate change as an inconvenient myth. Well, from now on, every American who walks into a polling place can and should vote to kick out anyone who stands in the way of energy independence. "But it is also time to put Washington to the test. Time to tell powerful interests that the old era has ended and so have their easy arrangements. Then instead of empty slogans and long laundry lists of bite-sized ideas that tinker at the edges of outdated policy, we can embark on revolutions that will put our energy future in our own hands and put global climate change at the top of the national agenda where it belongs. "Today I want to focus on the three big steps that are imperative to addressing global warming and transitioning to dependence on homegrown sources of energy. First, I believe we need to establish an oil goal and implement an aggressive set of policies to reach it. Second, I believe we must immediately expand the availability, production, and distribution of renewable fuels to run our cars. And third, we need to get serious about climate change and take measures to freeze and reverse our greenhouse gas emissions. "To start: We must establish mandates for reducing U.S. oil consumption by 2.5 million barrels of oil per day by 2015 - an amount equivalent to the oil we currently import from the Persian Gulf. "Yes, I said mandate -- and I said it because we have lost too much time for voluntary measures to be put to the test. And we can't just set a mandate - we have to provide incentives to businesses and industry to make the mandate achievable. "We must significantly ramp up our production of Flex Fuel Vehicles. They run on alternative fuels, like E85, a blend of 85 percent ethyl alcohol -- a home-grown, domestic, completely renewable source of fuel that burns cleaner than gasoline. "Other countries already know something we don't. Actually they've been doing something we won't - something influential interests don't want us to do. Thirty years ago when Brazil faced an energy crisis they got serious about alternative fuels. Relying on new stocks of homegrown fuels in addition to its own oil production, this year Brazil will achieve energy independence. If Brazil can do it, why can't we? If a developing country can go from 90 percent dependence on foreign oil to zero percent dependence in three decades, then we -- the most powerful, creative, industrial country on Earth - we can change the destructive course we're on. "Today, in this country, only six million vehicles - just 10 percent of all those on the road - can be fueled by E85, and less than one percent of the service stations have even a single E85 pump. To change that we must require - not just recommend - that an increasing percentage of new cars can run on E85 and that by 2020 all new cars will have the capacity to run on E85. 20/20: that's not just a vision, that's a real program to jumpstart energy independence. "But building these cars doesn't get you very far if there is nowhere for Americans to them fill up. What a Washington solution it would be if we built flex fuel cars but you couldn't buy the fuel - talk about a bridge to nowhere. We need to immediately expand our investment in E85 infrastructure. Mandate that 10 percent of all major oil company filling stations offer at least one ethanol pump by 2010. And to deploy this technology quickly, provide financial incentives to both independent and retail chains to install the new pumps. Just think -- we can put ethanol pumps in every single gas station in America for what we spend in Iraq in just one week. I don't think there's a Member of Congress who will want to tell their constituents they didn't think breaking our dependence on oil was worth as much as one week in Iraq. When the energy spending bill comes before the Senate, I will offer an amendment to get over 1800 E85 pumps across the country in the next year alone, and with your help we'll make the Congress vote yes or no - choose the status quo or choose America's energy future. "To ensure we have enough ethanol to meet our demands, we must also invest in the kind of ethanol produced from plant wastes and energy crops like switchgrass. And we must set a goal of having 30 percent of our fuels come from biofuels by 2020. Believe me, if we're spending 2 billion in Iraq in one week, we can commit $2 billion in funding for cellulosic biofuels over the next ten years! "Energy efficiency can be a powerful weapon in the arsenal of our democracy and is as indispensable as armor and munitions. We have to combat the threat to soldiers that comes not just from gun barrels but from oil barrels. We should all be incensed that we are in effect financing both sides in the war on terror every time we fill up our tanks. We can't keep asking American troops to risk the ultimate sacrifice in Iraq if those of us on the homefront aren't ready to make even the smallest sacrifice to help them. "I remember sitting with a top CEO from the auto industry in the spring of 2003. He'd come to see me to talk about automobile efficiency standards. I asked him why the American auto industry seemed unwilling to build more fuel efficient cars. He told me that the American consumer wouldn't buy a more fuel efficient car. He asked me, "Why in the world would we change everything to build more fuel efficient vehicles when no one wants them?" Three years later as the demand for hybrids and high mileage vehicles soars, the Japanese are there in the market and our own companies are struggling to catch up and even survive. "With leadership in Washington through a combination of incentives, grants and standards, we can and must at last revolutionize the way we drive. "We must no longer be afraid of the third rail of energy policy - fuel economy standards. Fuel efficiency standards have been essentially unchanged since 1980. Think about that. Jimmy Carter was President, my daughters were playing Atari and wearing leg-warmers, apartheid was a way of life in South Africa, and America was tuning in to find out who shot J.R. Since then, because Washington stood still, captive to powerful interests, the average efficiency of vehicles has actually declined. The United States can't have a serious policy for oil security until we leave the 1980's behind - entering the 21st century by demanding a major increase in the fuel economy of our cars. "Massachusetts and California have led the way cutting CO2 emissions from cars, leading the way for more efficient cars in these states. But state action alone cannot meet this national challenge. Washington must do its job, too. We need to establish a federal standard for controlling carbon dioxide emissions from cars and trucks. If the entire country did what Massachusetts and California are already doing, we could raise fuel efficiency by 40 percent. "Building the cars of the future - fuel-efficient, advanced-technology vehicles - will require automakers and their suppliers to retool their factories. I believe the federal government has a responsibility to help them remain competitive. Tax credits will help support the necessary investments, make the new technologies cost effective, and create jobs for the workers who will build the cars of the future and help consumers buy them. We should commit $3 billion to this effort in tax credits over the next five years - tax credits that will not only help reduce oil dependence but which will pay for themselves through tax revenue generated by the growth and productivity that follow. "But like all the funding in my proposal, let's not leave it subject to the whims of Congress and an army of appropriators. We need to create a new security and conservation trust fund to guarantee the resources to move the nation towards energy independence. This isn't a matter of capacity, it's a matter of willpower. We have the money, the question is whether we have the right priorities. Just by rolling back the tax breaks for big oil which even President Bush opposes, and by renegotiating oil leases, we can invest in a fund for energy security. "Instead of a tax code that works for the K Street lobbyists, let's provide an aggressive set of tax incentives and grants to ensure that by 2020, 20 percent of all passenger cars and trucks on the road will be fuel efficient, low emissions hybrid vehicles. Sure, hybrid vehicles are more expensive today. But they don't have to be if we put a little presidential muscle behind them. The doors of college were only open to the rich and powerful until President Lincoln pioneered a system of Land Grant Colleges that gave us UMass and URI and the University of Connecticut. After World War II, highways and roads were underfunded by local governments and some were unusable until President Eisenhower pushed through a national highway system. You want hybrid vehicles out on those highways? Make it affordable for Americans to buy American hybrids - because that's a hell of a lot better than subsidizing Saudi sheiks who look the other way while madrassas teach kids hatred and violence. "Here's another bottom-line: Good energy policy is also fundamental to coping with global climate change. In 1992, I was part of the Senate delegation to the Rio Earth Summit. I was continuing an interest sparked when I lead efforts in the eighties to deal with acid rain -- efforts that culminated in our creating a Cap and Trade system for emissions and making it part of the Clean Air Act in 1990. I believe that George Herbert Walker Bush - Bush "41" -- can be proud that he was a President Bush who signed into law bills to help us reduce pollution. "The story since then is not just a disappointment -- it is a flagrant, dangerous, arrogant disavowal of science at the behest of the powerful. It is a damning story of public irresponsibility and private profiteering. Those who have encouraged, facilitated and acquiesced in it will go down in history as modern day robber barons who sold out future generations for their own selfish gain. We need to use this November to throw the robber barons and their cronies out of the Congress and put the peoples' interests back in. "Each year since 1992, the science has become more certain. What was theory in some areas is now proven fact. Scientific models have become more sophisticated and more accurate. Across the world scientists and national leaders - except ours -- have spoken out and acted decisively. Only the United States stands out as a flat earth holdout for inaction. When confronted by scientific facts, leaders must not change the facts to suit their politics; whether the issue is global warming, stem cell research, or Iraq, leaders must tell people the truth. "In the last month Al Gore's "Inconvenient Truth" has brought the science to millions of Americans in a dramatic and persuasive way. Al was an early leader and a visionary on climate change - and if he had not just been elected but been inaugurated as President, America today would be the world's leading advocate, not the world's leading opponent of climate change. "The question now - even more than it has been for the last years - is not whether climate change is happening but what are we going to do about it? No, I don't mean how does the political system moan and groan and adopt makeshift responses. I mean what are we really going to do? How do we turn this danger into opportunity? How do we meet a challenge of epic proportions with an epic American response? "Well we have to start by ending the bizarre disconnect of American politics. Real crises stare us in the face, screaming for solution. But non-existent, contrived ones replace the real ones on the agenda of a Congress that wants to change the political climate instead of dealing with climate change. They remain bent on dividing the country with flag burning and gay bashing amendments to the Constitution when we should be strengthening the country with a determined attack on global climate change. "Compare that kind of craven politics, to last week's announcement by the nation's leading climate scientists -- a shocking new report that revealed that the earth's temperature is at a 2,000 year high. The scientists said - let me just read it to you - that the "recent warmth is unprecedented for at least the last 400 years and potentially the last several millennia" and they also stated that "human activities are responsible for much of the recent warming." "Unless we deal with global warming boldly and quickly our world will undergo a string of terrible events in both the Atlantic and the Pacific far worse than Hurricane Katrina. "Never before have so many people lived so close to the coasts: More than a hundred million people worldwide live within three feet of sea level. Some of the world's greatest cities like - New York, Shanghai, Bangkok, and Tokyo - are at risk. "So we need a plan that actually does what the science tells us we have to do to. That's why I will be introducing in the Senate the most far-reaching proposal in our history. Nothing else will protect our security and our world. And I believe that anyone who knows the urgency of this global challenge, would be fighting to make this our national policy. And that is what I'm going to do. "It will stop and reverse U.S. emissions of carbon dioxide and other greenhouse gases. I propose establishing an aggressive economy wide cap and trade program to reverse emissions growth starting in 2010. After that, we will progress to more rapid reductions and end at 65 percent below 2000 emissions by the year 2050. "At the same time, we cannot be reckless about the economic impacts. We must ensure American businesses remain competitive with the rest of the world. To achieve that goal, my plan will provide the tools to help the economy transition to new clean energy technologies, protect workers and affected communities, and protect companies and consumers from energy cost shocks. We will provide tax incentives for good behavior and increased funding for research, development and deployment of clean energy technologies. And I believe we should double the federal government funding for research and development to support private sector energy research, demonstration, and deployment. "The U.S. is the world's single largest emitter of greenhouse gases, but the U.S. alone cannot solve the challenge of climate change. It is going to take action from other countries - - both developed and developing. We must re-engage in discussions with the international community and work together to plan a path forward. It's a global problem and it's going to require a global solution. "We have big challenges to solve - and a whole host of people in Washington who don't know how to tackle them, and a whole cast of political consultants who will counsel their candidates not even to try. "That's where you come in. You need to push the curve. You need to shake things up. A Saudi Arabian oil minister and a founder of OPEC once said, "That the Stone Age came to an end not for a lack of stones, and the oil age will end, but not for a lack of oil." We are not about to run out of oil, but the consequences of endless dependence on oil are too great, too profound, and too dangerous for our nation. Rather than have our energy policy be the last big mistake of the 20th century, we can and must create a policy that is the first great breakthrough of the 21st century. "So for the second time in our history let's declare and win our independence. This time not from foreign rule but from foreign oil. If we are as Lincoln said the "last best hope of Earth," let's stop being the denier of global warming that endangers the Earth. Let's give our people back the truth, and let's give the world back its future.